Taking your pet on holiday is becoming an increasingly popular option, and as a result, more and more holiday destinations are becoming pet-friendly. Are you thinking of heading to Queensland for your next holiday, and hate the idea of leaving your furry friend behind? We’ve put together a list of the 20 best pet-friendly accommodation options for your next holiday in Queensland. Deshons Retreat offers boutique hideaway accommodation in the heart of emerging food and wine country. Located a 2.5 hour drive north-west of Brisbane, it’s nestled on the slopes overlooking the panoramic Booie Valley. The accommodation itself offers designer, self-contained, king-sized retreats with tons of quirky personality. In spring and summer you can enjoy bursts of native flowers, endless starry skies and wild rabbit and wallaby spotting. Autumn and Winter is a time for indulging with a bottle of local wine by the fireplace. As for pooch, Deshons Retreat offers cool canine accommodation in the form of a large straw bale kennel and extensive fields in which to explore. If your pooch prefers the endless stretches of golden sand and requires incredible water vistas from their hotel room, then the over-the-top luxury of the Palazzo Versace might be just what you’re looking for. Now offering exclusive Palazzo Pet Packages, your furry companions can also enjoy the 5-star trappings of this incredible resort. Think designer pet beds, food and water bowls bedazzled with crystals, and beautiful beaches just steps away. Driftaway Villas are a small set of villas set one street back from beautiful Yorkeys Knob, 10 minutes north of tropical Cairns. Homestyle accommodation, each three-bedroom villa is pet friendly with their own generous sized private yard and outdoor entertaining area. The beach is less than 100 metres away and offers an enormous off-leash stretch of sand. Sea Shanties at Amity Point on picturesque North Stradbroke Island is set on the water’s edge overlooking the bay and out to Moreton Island. It’s the kind of old-school accommodation where Dad can fish, Mum can relax with a book, and the kids can walk barefoot to the shop for an ice block. The family dog is a must for this scene, and luckily there are plenty of dog-friendly beaches on the beautiful island located 30km from Brisbane. The accommodation? Eight basic cabins shaded by hundred year old Pines and Pandanus on an acre of absolute waterfront. Award-winning Lake Weyba Cottages is nestled on the shore of Lake Weyba, a 15-minute drive to Noosa and just five minutes from dog-friendly Peregian Beach. You’ll find 20 acres of stunning gardens for walking your friend, complete with natural lagoons for swimming and kangaroos. Each cottage features a double spa with views, a wood burning fire for winter, and a private veranda where you can enjoy an intimate dinner cooked by your own private chef. Dogs are allowed in the cottages and will have plenty of space for running around, and providing your pooch is happy to stay on the lead he can even visit nearby Peregian Beach Shopping Village which is pet-friendly too! Teacosy Cottage is a quaint dog-friendly cottage on beautiful Karragarra Island. The views from the deck are simply stunning, overlooking Moreton Bay and its neighbouring islands. Offering a fully fenced big yard to run around in, it accommodates up to five people in the two bedrooms. As for the island, at only half a kilometre wide and four kilometres long, it’s the smallest of the Southern Moreton Bay Islands, and is perfect for exploring with pooch. One of the leading pet-friendly options for a family looking for a fun-filled holiday is the Big4 Gold Coast Holiday Park. Not only does it have designated pet-friendly cabins, these cabins include dog grooming and dog-sitting facilities. Standard restrictions do apply but they truly do love dogs, and offer oodles of room for off-leash running. Dogs are also welcome on selected sites, powered sites and ensuite suites, but you must advise management of your intention to bring your pet at the time of booking. With a beachfront deck and spa, this little shack is budget luxury. Tastefully decorated and functional, it sleeps a max of four people, but offers plenty of room for your furry friend too. Views from the spa are across the palm fringed, pristine South Mission Beach out to Dunk Island, and with plenty of street parking there is room for you to bring the boat too. Dogs are accommodated in dedicated fence areas and are free to roam the Rumpus room and front veranda. Coleyville Lodge is a horse and dog friendly accommodation for responsible owners who love to share their holidays with their pets. Available to all guests who stay at the property, you can bring your pet with you, whether camping or staying in the country homestead or cottage. A working cattle farm located in the picturesque Scenic Rim, it offers a number of large grassed areas, paddocks and treed creek edges to play with your dog or ride your horse. At Adogma’s Cottage, cats and dogs are always welcome, making it the perfect holiday destination for all the family. A beautifully restored 1930s Queenslander, pets are more than welcome inside and with strong pet proof security doors, there’s no need to worry about your pets breaking out. Inside you’ll find ornate high ceilings, three bedrooms and a quirky, eclectic mix of quality furnishings. Outside, you’ll find a fully fenced yard and a nearby leash free park. Located just 2km to the east of Brisbane CBD, New Farm is one of Brisbane’s most beautiful inner suburbs. Fondly referred to as the city’s ‘Little Italy’ it’s a suburb full of charm and natural wonder. Edward Lodge is positioned close to Brisbane’s ‘must-do’ sites and is just a few minutes walk from the Sydney Street Ferry Wharf which will get you to the heart of the CBD via City Cat on the river in just five minutes. Each spacious, designer room is consistent with the building’s 1912 style and small, manageable dogs are allowed. This spacious four-bedroom house offers accommodation for 6-8 guests plus a pooch is welcome outdoors. Private and peaceful, it’s located just a five-minute walk from beautiful Coolum Beach and its popular restaurants, shops and Surf Club. There’s also a pool, a fully fenced yard and plenty of grassy space to play. Escape to a modern retreat amongst the gold, ghosts, greed and grandeur of Charters Towers. Take a step back in time and discover this enchanting town, found 1.5 hours west of Townsville. When gold was first discovered in Charters Towers in 1871, it quickly became the second largest town in Queensland, and today the magnificent heritage buildings are a testament to the prosperity of years past. Positioned centrally and offering a variety of pet-friendly accommodation options, the Aussie Outback Oasis Cabin and Van Village is the perfect place to explore it all. Tailwaggers Rainforest Retreat is the ultimate dog-friendly accommodation, offering ocean views, pristine rainforest walks, a fenced leash free area, a hydro bath and undercover training area. Each self-contained cabin even has its own doggie door from the cabin to the front grassed yard. This really has to be the Gold Coast’s best pet-friendly accommodation. At Lync Haven Rainforest Retreat you’ll be just 3.8km from Daintree Entomological Museum and 5km from Alexandra Bay Waterfall. Explore the Daintree with a 4WD tour, enjoy the Cooper Creek wilderness or take a river cruise to spot some giant crocs. Pets stay free and will love the extensive grounds and nearby Cape Tribulation walks. Broadbeach is fast becoming the Gold Coast’s most popular destination and Raffia House sits right in the heart of all the action. A true tropical resort with a fully fenced and private canal at the end of the lawn, it has a five-night minimum, but is the ultimate pet-friendly Gold Coast escape. Nearby you’ll find Jupiter’s Casino, the Gold Coast Convention Centre, Pacific Fair Shopping Centre and the endless stretches of each the Gold Coast is famous for. The Palms offers 5-star condos, family villas and powered sites suitable for motorhomes and caravans up to 28ft. Dogs are welcome on any of the caravan or camping sites, however they are restricted from the cabins. Located in the heart of Hervey Bay, widely known for its calm waters and family-friendly activities you’ll find nearby adventures of all kinds, from self-sailing catamarans and jet skis to sunset cruises and scenic flights over the Fraser Coast. Rainbow Beach is famous for beach camping and one of the best campgrounds would have to be Inskip Peninsula. A narrow finger of land 12 minutes north of the Rainbow Beach Village, its absolute beachfront sites offer a surf beach on one side and a stillwater tidal bay on the other. Dogs are allowed, providing they are kept on a leash. If you think you can’t enjoy a bush experience with your dog, think again. Keen campers will love Flanagan Reserve, situated on 12 hectares in the Scenic Rim region near Rathdowney, it offers modern conveniences like hot showers and flushing toilets, as well as a ton of prime unpowered camping spots. Take your dog down to the river and enjoy the magnificent sunset over Mount Maroon. When taking your pet on holiday, it’s important to do your research. In Australia, domestic dogs and cats are banned from National Parks, nature reserves, Aboriginal areas and State Recreation Areas because they are potentially dangerous to the native wildlife. That said, there are forests that allow pets for visits during the day and overnight camping. When booking pet-friendly accommodation, always contact the destination before departing on holiday. Often there are conditions relating to pets staying that you need to know about, including the types of animals allowed, the time of year they’re accepted, bedding, lead-requirements, vaccinations and medical history etc. You should also pay a quick visit to your vet so they can do a quick check of your pet’s health before departing. Whilst there, get them to print off a copy of your pet’s medical history and proof of vaccinations so that you can take it with you. Lastly, respect the rules when booking pet-friendly accommodation. 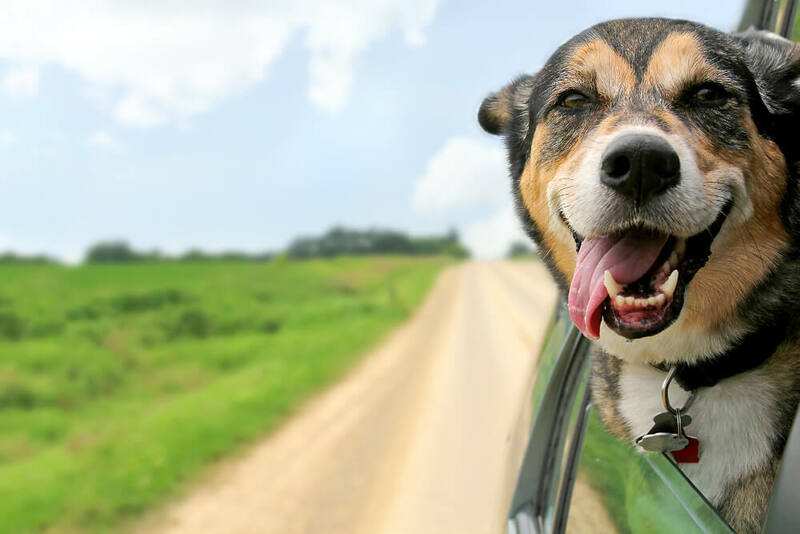 It’s a privilege to take your pet with you on your travels, and the better behaved your pet is during their time away, the more likely accommodation providers all over the country will open their doors to companion animals.